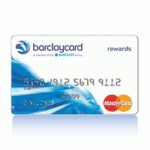 The Barclaycard Rewards MasterCard is now available, and as a middleweight card it is available for people with average credit scores. What features does this card have to offer, and how does it stack up for people with average credit scores? This review will help you find out. The major deciding factor for the provision of credit is the interest rate, and with a highest possible APR of 24.99%, the Barclaycard Rewards MasterCard is applicable for people with credit scores starting at around 600. Barclaycard occasionally offer this card to people with scores lower than 600, though the vast majority of successful applicants have a higher score than this. Many of Barclaycard’s affinity credit cards are designed for people with better credit scores, with a number of significant rewards and low interest rates. The Rewards MasterCard offers similar terms to these affinity cards, and a point program that provides a good amount of points on everyday spending, so even with an average credit score you can capitalize on the available benefits and receive cash back or rewards for your spending. With 2 points per dollar on general purchases (gas, groceries, bills…), and 1 points per dollar for everything else, as long as you stick within budget and pay what you owe, you not only increase your score over time, you earn plenty of points to redeem for a range of rewards, including cash back to help you pay for purchases over $25. General purchases like gas are an unavoidable part of life, so it is always an advantage when you get more for your necessary expenditures. The 2,500 bonus points for your first purchase is the icing on the cake. As well as this rewards program there is also 0% introductory APR on purchases and balance transfers for 6 months. This gives you purchasing freedom for this period, and if you hold a balance on another credit card you can make a transfer and save by paying no interest. Many points programs for average ratings come with restrictions, but with this card there are no expiration dates, blackout dates or cash back limits. The key with this credit card is to understand the charges and fees in the terms and conditions. There is a risk involved with lending to people with average ratings, and this is reflected in the high cash advance APR and the penalty APR with this credit card. This means if you do not stay on good terms, you not only face high charges, but a possible impact on your credit rating as well. Standard APR is either 14.99%, 17.99% or 24.99%. With an average credit rating you can expect the 24.99% rate. Cash advance APR is 25.34% and penalty APR is 30.24% for people who secure the 24.99% rate. There is no annual fee, and $35 is the maximum fee for late payments or returned payments. Foreign transactions are 3%. Click Here to apply. Use the points you earn like cash to pay for almost any purchases you’ve made. No blackout date, no redemption fees, no limit on the points you can earn and no complicated set up. Complimentary FICO® Scores as a benefit to active cardmembers. Opt-in to have instant and convenient access to FICO® Scores from your Barclaycard online account.